Bunny church (photo: A. Nicholson, 2003). THE valley of Bunny was carved out in the Ice Age. The hills of this village show the glacial drift. A deposit of sand was left in the valley, through which the Fairham Brook flows. Fossilled oyster shells have been found in the soil when dug to a depth of five feet. These, we are told, belong to the Jurassic period of 150 million years ago. Two huge teeth have been dug up, and these were identified as belonging to horses of the Ice Age, or Pleistocene, and not to a modern one. The sand in which the shells were found was as clean as the sand of the sea. In 1947 a Roman bowl of the First Century was brought to light, when a new garage was being made at Bunny. It is now in the Nottingham Castle Museum. After the subsidence of the waters, marshy land was left, and there was a great growth of vegetation which had been undisturbed for many years. The Saxons made a settlement here, and called it Bune. This is an old English term for a reed. It has been named Bonei, Boneya, and in Thoroton we read of it as Boney. We see it was spelt Bunney in 1725 on a memorial. Bunny is on one dated 1741. Levenot, a theyn of Edward the Confessor, who reigned from 1042—1066 was the first known overlord of Bunny. There was a church, a priest, and land for six ploughs, also a mill at this period. Fitz Hubert was the successor to Levenot. We gather that it was cultivated before 1086, for at that date it had diminished in value, according to the Domesday Book. History says Fitz Hubert let the foundation of the land to Lenton Priory. In 1225 Anker de Boneya added two meadows to this gift, and later on, you will see that this led to a dispute. Meanwhile, one of the family, Walter de Bonya, was drowned, and the Manor descended to die Freschvilles. In 1218 the Sheriff demanded that Philip Mare should have certain lands here of Ankerde Freschville, who also held the "Manor of Caruch in Darbyshire"—Thoroton. Mare had been one of King John's untrustworthy men, a terror to the district. He, however, made peace with Henry III, and in 1221 obtained the custody and marriage of the heir of the Fitz Ralphs, and took part of Bunny for himself. We are told that the advowson of Bunny Church was in dispute at this time between Ralph de Freschville and the Dean and Chapter of Southwell—so they were determined to settle by the old method of trial by combat. Neither judge nor jury could decide the tangle of evidence—so the decision was left to God—theory being that God would ensure victory for the right. Ralph de Freschville died, and the new owner, Anker de Freschville, forfeited his possessions by taking part with the barons in 1264, so now Bunny was Crown property. A heavy fine was imposed for its redemption. Anker de Freschville died before it was paid off, His son was placed with Richard de Grey, of Codnor, at that time. A new earldom of Lancaster was created at this date for the King's son, Edmund, and the overlordship of Bunny was transferred to this (in 1288). In the reign of Edward I (1272—1307) there were many disputes amongst the religious bodies concerning the Rectory and its tithes, and appropriation of lands by monasteries. In 1288 the Rector of Bunny, William Heccredibre appealed to the court of York successfully, and the official of York now said that the tithes of Bunny belonged to the Rector, and not to Lenton Priory and Convent. In 1323—1324 the Chapter of Southwell appropriated the church of Bunny, to make a chantry for the soul of William, Archbishop of York, but in 1346 it was claimed by the Priory and Convent of Ulverscroft. A royal pardon had not been obtained—a serious omission —so an arrest of all persons was made, who, in the Court of Rome, obtained Bunny Church. When the Priory had this church in 1354, it was found in a state of arrested reconstruction owing to the Black Death, 1349. Ulverscroft Priory was ordered to repair the walls, complete re-building, instal a Vicar, and erect a vicarage. These orders clearly point to the existence of a church in Bunny before this. There was a hermit's meadow at this time and a common bakehouse. Each of fourteen villeins had to find a cart one day in the winter, and one day in Lent, and harrow the lord of the manor's land, and cart the hay, according to the season. At Bradmore the farmers had to cart bricks to Wollaton, a task which they enjoyed for we arc told plenty of ale and bread and cheese were given to them. Disputes arose again amongst the religious bodies, and Lenton sued the parson of the parish for mowing the grass, and taking away the crops. There were no male heirs to the Belers of the Manor at this time, so the estate came to the Swillingtons. Roger de Swillington held the Manor of Boney, Bunney, by right of his wife Margaret, who was one of the daughters of Roger Belers. Richard de Cromwell was the son of Amicia, sister of Roger de Belers. The former held a meadow called Crimitefindon and two acres of land in Milewang in Bunny. Margaret Swillington conveyed Bunny by marriage to Sir John Gray in 1420. In 1425 Cromwell, as rightful heir to the Belers, sued John Gray for the Manor. The defendant did not appear. He was fined £120, but Cromwell forgave him. In 1429 the jury found the Gray claim good, but the next year the court decided again in Cromwell's favour; so Ralph, Lord Cromwell, was overlord of Bunny, and also had the Manor of Cruch of Derbyshire. Cromwell installed a bailiff to look after Bunny but in the time of Edward IV (1461) passed it to the Illingworths. The family of Cromwell descended from Richard de Cromwell, son of Amicia, sister of Roger Belers. In the reign of the Illingworths we read that Richard III marched through Bunny to Bosworth. There was one weaver in the village in 1494. Wool was grown locally by the Prior of Ulverscroft, who, in 1513 enclosed land for tillage. Lenton Priory received £2 6s. 8d. a year for tithes from Bunny. In 1541 Bunny was growing, and it was able to send eleven men " fit to bear arms " to the muster of 1539. In 1504 Richard Illingworth died, leaving four daughters named, respectively, Joan, Alice, Anne and Mary. I may just mention here that George Barlowe, of Stoke, married Joan Illingworth, Alice married John Kniveton, and had a son Thomas, who was guilty of treason for counterfeiting the money of England called Mary's groats. These were silver coins, issued by Mary in 1553, but discontinued by Elizabeth in 1562. Elizabeth, daughter of Adam Beresford, of Fenny Bentley, Derbyshire. Humphrey Barlowe died in 1570 and his widow, Elizabeth Barlowe, married Richard Parkyns. The Parkyns lived at Madresfield, in the county of Worcester. They descended from Peter Morley, alias Perkyns, of Shropshire. John Parkyns was the grandson of this Peter Morley, who in 1393 held land at Madresfield. Richard Parkyns was his great-great-grandson, and as before said he married Elizabeth, the widow of Humphrey Barlowe. We shall go back to the Parkyns family. At this time history says that Bunny was still growing. Sir Thomas Stanhope, of Shelford Manor, had land here, four swathes of meadow which had been given to maintain a lamp in Rudding-ton Church. In 1559 there was trouble again at Bunny. Elizabeth's commissioners found that the prayer books had been burned (new service books had to be obtained), and the parish had been without a priest. This must have been between the time of Henry Rawdon, Vicar, Patron Edward VI, and John Drewyn. A Vicar was instituted, and he was called to account for "admynistering the Holy Communion in a stone potte instead of a challice." There was compulsory attendance at Church at this time. Bunny people did not like this. One man, John Smalley, was found to be absent at geese eating for three Sundays, and he was fined three shillings (1608). At Bradmore, six men were morris dancing on Sunday, and they also were fined for "profaning the Sabbath." "Here lies Humfrey Barley, son and heir of Thomas Barley of Stoke, Esq., and Dorothy Meverell, wife of the said Thomas of Stoke aforesaid Esq., and Alice (it must be Joan) his wife, one of the daughters and heirs of Richard Illingworth Esq. This Humfrey was thereby one of the lords of the Manor of Boney and divers other lands in the counties of Nottingham and Derby, and took to wife Elizabeth, eldest daughter of Aden Berresford of Fenny Bentley in the county of Derby, by whom he had Ursula, his daughter and heir. 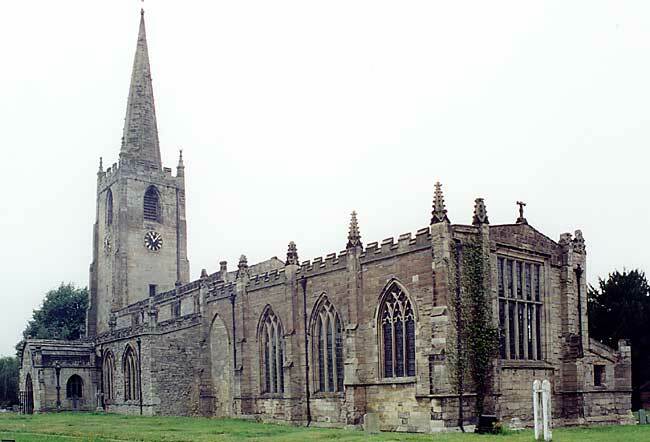 The said Humfrey died the 10th of July, 12—, and was buried in his chapel at Stoney Middleton in Derbyshire. And this monument was erected by the said Elizabeth in perpetuity of the said Humfrey and his progeny." His widow married Richard Parkyns. There had been many law suits concerning the lands of Bunny, but now these claims were ended. Richard Parkyns bought the reversionary interests at Bunny and Bradmore. This was the beginning of the long ownership of the Manor by the Parkyns family. Richard Parkyns kept adding to the estate year by year. Richard Parkyns was a barrister and Recorder of Nottingham and Leicester. He was also M.P. several times. A new charter was granted to Leicester in 1599 and Richard Parkyns was appointed a Recorder for life. In June 1603, Anne, the wife of James I, stayed at Leicester for the night. She was to have been presented the next day by an address from Richard Parkyns, but he was taken ill, returned to Bunny, and died in July, 1603. He bought the Manor of Bradmore in 1596 from Sir Percival Willoughby, who had married the eldest daughter of Sir Francis Willoughby of Wollaton. There are some laudatory verses to "Sir George Perkins of Bunny" in William Sampson's book. Sir George Parkyns was knighted on the Accession of James VI of Scotland to James I of England. George Parkyns succeeded his father, Richard Parkyns. He married Mary, the daughter of Edward Isham, of Walmer Castle. George Parkyns was a barrister and M.P. for Leicester in 1597. He was knighted, and became High Sheriff of Nottingham. After his death in 1626, he was followed by his son, Isham Parkyns, who was a Royalist, and in the Civil War earned fame by his gallant defence of Ashby-de-la-Zouch. In Prince Rupert's journal we read that within a few days of the raising of the Standard at Nottingham the Prince and his troops came to " Mr. Perkinn's howse" at Bunny and went on to Swanstone the next day. Queen Henrietta, daughter of Henry IV of France, was received at Bunny Hall on her perilous journey from Newark to Oxford. In Mrs. Hutchinson's journal we read that Dr. Huntingdon Plumptre, having provoked Colonel Hutchinson to strike him for insolence, sought shelter at Bunny for himself and his family. His estates had been seized by Parliament. He had to pay a heavy fine before the sequestration was removed. In June, 1645, Sir Thomas Fairfax besieged Ashby Castle. By the end of September the garrison was reduced to 60 men. Early in 1646 the castle was surrendered on the terms that they were to march out with all the honours of war and that the sequestration of the estates of the Earl of Huntingdon, Lord Loughborough, and Colonel Parkyns, the governor, should be taken off after payment of the heavy fine as before mentioned. Colonel Parkyns was allowed "to live quietly at Bunny and to enjoy the estate free from plunder and violence of soldiers." The fine amounted to the "fifte and twentieth part of his estate real and personall." This gallant soldier died in 1671 and his son Thomas was created a baronet in honour of his father's loyalty. This son died in 1684. His son, Sir Thomas Parkyns, the second baronet, followed him. You cannot dip into the history of Bunny without mentioning the Parkyns family. The grandson of Colonel Isham Parkyns, he was the famous wrestling baronet, and benefactor of the village of Bunny and Bradmore. The exact date of his birth is not known, but he was baptised November, 1662. Sir Thomas went to Westminster School under Dr. Busby, and in 1680 admitted to Trinity College, Cambridge, and while there met with Sir Isaac Newton, who noticed his liking for mathematics, and after this he spent some years at Gray's Inn. It was the custom at this time for the nobility to place their children in these Inns of Court, to teach them not only law but a knowledge of good manners, fitting them for associating with the highest in the land. We may note here that eight members of the Parkyns family were admitted to Gray's Inn. Sir Thomas succeeded his father in 1684. He married Elizabeth, the daughter of John Sampson, of Derbyshire. His son, Sampson, was born in 1686 and died in 1713, and Thomas was born in 1687. He died in 1706. Sir Thomas did great things for the village. He re-built the farmhouses, also the Vicarage. Architecture was amongst his many accomplishments. He designed and drew out his own plans.